Randall, Richard. (Forthcoming). “Pittonkatonk and Valuing Music as a Public Good” In (Eds.) R. Garafolo, E. Allen, A. Snyder. HONK! : Mapping a Street Band Renaissance, Rutledge (New York, NY). 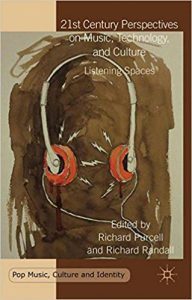 21st Century Perspectives on Music, Culture and Technology: Listening Spaces. Palgrave McMillan, 2016. Eds. Purcell, Richard and Richard Randall. This collection presents a contemporary evaluation of the changing structures of music delivery and enjoyment. Exploring the confluence of music consumption, burgeoning technology, and contemporary culture; this volume focuses on issues of musical communities and the politics of media. Randall, R. and R. Purcell. Introduction: Listening in on the 21st Century. Gholz, C. The Scream and Other Tales: Listening for Detroit Radio History with the Vertical File. ‘On Tape’: Cassette Culture in Edinburgh and Glasgow Now. Curran, Kieran. Roessner, J. Radio in Transit: Satellite Technology, Cars, and the Evolution of Musical Genres. Grebowicz, M. The Internet and the Death of Jazz: Race, Improvisation, and the Crisis of Community. Purcell, R. A Brief Consideration of the Hip-Hop Biopic. Randall, R. A Case for Musical Privacy. Hubbs, G. Digital Music and Public Goods. Sterne, J. The Preservation Paradox. Newman, K. M. Headphones are the New Walls: Music in the Workplace in the Digital Age. Gopinath, Sumanth. Researching the Mobile Phone Ringtone: Towards and Beyond The Ringtone Dialectic. Copyright © 2018 Creative Commons Attribution-NonCommercial-NoDerivatives 4.0 International License.